A beautiful reminder of those days in Barcelona! Inspired by the famous works of Antonio Gaudi, this exclusive Art Nouveau design is as original today as it was in the days when Gaudi designed his masterworks. 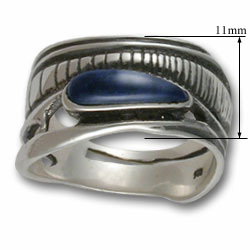 Adorned with a beautiful piece of lapis lazuli, this sterling silver ring is both comfortable & smart-looking! 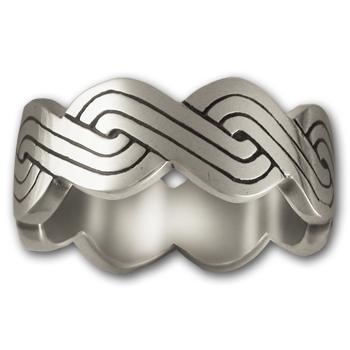 I am enjoying my ring very much; it brings to me a reminder of genuineness and compassion. This is a really cool ring. Nicely executed. Great quality. Very comfortable. I received this ring the other day and I love it! It's big enough that it doesn't look out of place on my hand. When I received it I found out I had ordered one size too big, but I had no problems getting it exchanged for a smaller size. Great ring, great company. This was my second purchase from Moonstone, and I'm very pleased with the ring. It has the exotic, alien appearance that you'd expect from a Gaudi design. The band it broader, so I would say it is a somewhat androgynous design. The lapis stone has a good deep blue color. The stone stands out farther from the band than I had expected (maybe 2mm). My only issue with the ring is that it is a very snug fit. Size 8 rings usually fit me perfectly, but this one is a little tight.